This post is sponsored by Fellowes and The Motherhood, all opinions are 100% mine. … its absolutely bare. In fact, I am really far behind getting it ready for the kids to arrive on August 5th. 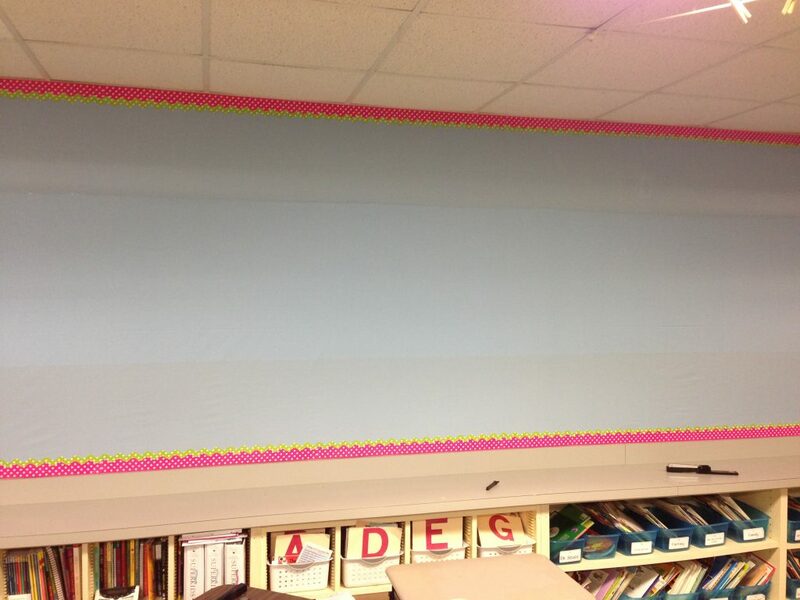 I finally tackled the big ugly wall in my classroom and put up some nice blue fabric to create my word wall. I think it looks great, but it needs some labels and signs to make it look the way I want it to. Enter my Fellowes Saturn2 95 laminator. This little beauty has been a lifesaver the past few days. I am unable to get into school right now because I am busy being a mommy. I just can’t leave my kiddos at home to go in and set up my classroom. With my little laminator buddy, I can now make things for my classroom in the comfort of my home. This year I decided that my old word wall and alphabet needed a little updating. I have had the same ones up since I started teaching. With a little help from my printer and laminator, I now have a modern, bright set of alphabet cards for my word wall. Even better, these cards fit perfectly into the Fellowes 3 mil photo pouches that can be purchased at Staples. I love this because this eliminated the need to cut them out, what a huge timesaver! I was amazed with the quality. The 3 mil thickness was perfect for this project. 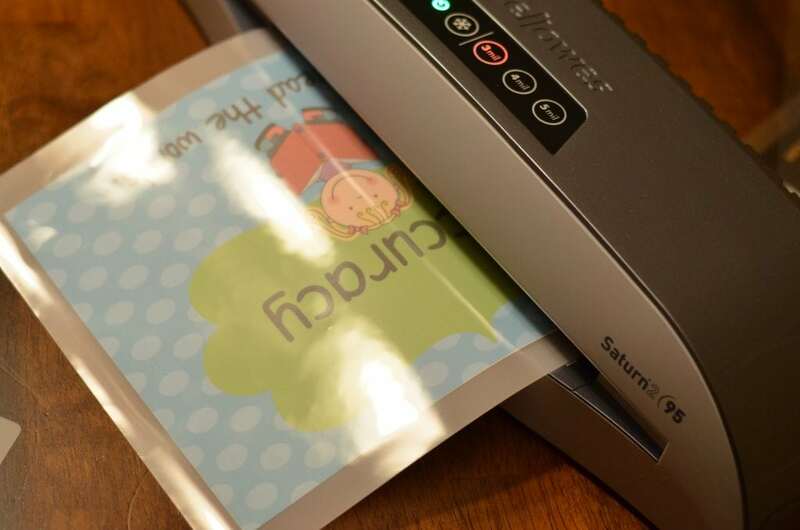 The laminator will also except thicknesses up to 5 mil for those special projects that need a little more protection. In addition to my word wall letters, I also printed out letters to label the parts of my room. These letters will spell out Word Wall for the large wall and I will hang them above my new alphabet letters. I also laminated my Reading Strategies Board headings to match my new alphabet. The bright colors are really going to stand out against the blue fabric wall. It only takes about 6 minutes for the Fellowes Saturn2 95 Laminator to heat up and be ready for use. The colors just pop when it goes through the plastic and they look amazing. I don’t think I could purchase anything at the teacher stores that would look as good as these do. Think of all the wonderful things you can make and preserve with a Fellowes laminator. You could laminate award certificates, special photographs, artwork, the possibilities are endless. 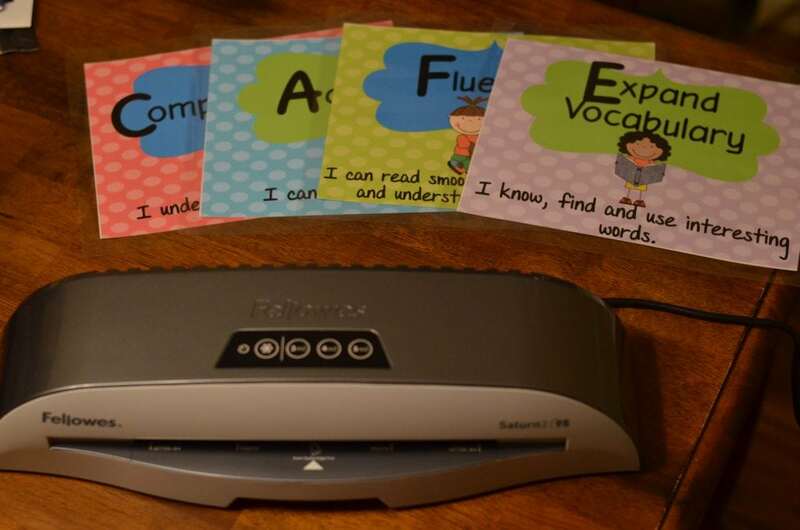 I had such a great time coming up with ideas, so I created a back-to-school-themed Pinterest board that includes fun home and classroom projects that can be created using the Fellowes Saturn2 95 laminator. I hope you check it out. The Fellowes Saturn2 95 laminator is available at Staples and Staples.com for a suggested retail price of $159.99. In addition to the Saturn 2 95, Fellowes offers a wide range of laminators and laminating pouches to suit a variety of needs. You can also find their products at Wal-Mart and Amazon.com. Do you know a hard working, deserving teacher? From July 15 – September 30, Fellowes can help you recognize a special teacher in your community with the “Celebration of Superstar Teachers” contest. Nominate an exceptional teacher on Facebook.com/Fellowes and they could win a Fellowes classroom prize pack, including a laminator! I know a lot of teachers who would love to have one of these at home! 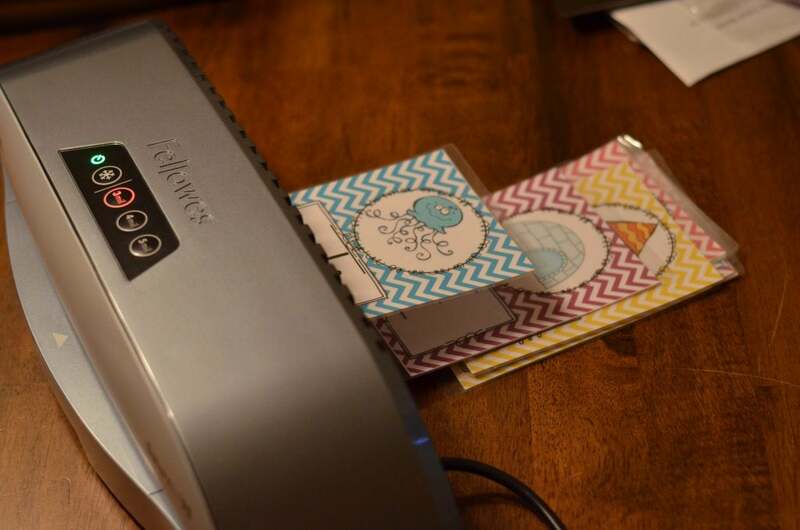 Fellowes is giving away one (1) A Mom’s Impression reader a Saturn2 95 laminator of their very own! « Your Potty Training Clean Routine Doesn’t Have to Cramp Your Style! 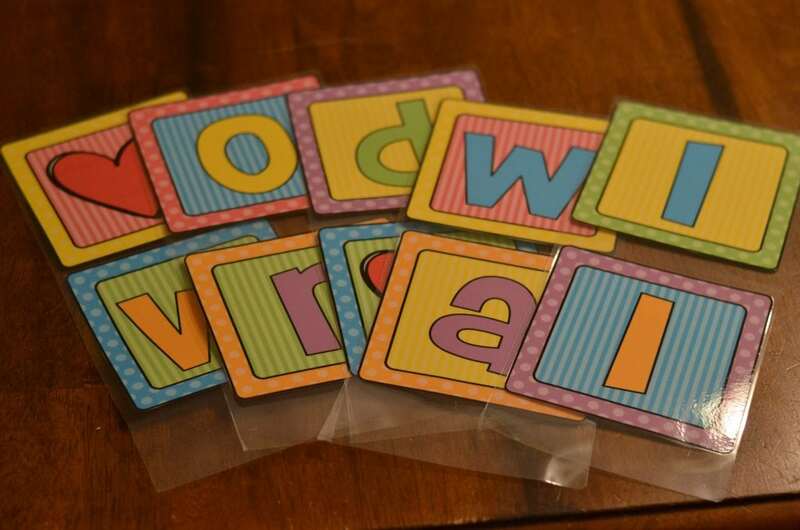 I would create sight word cards for my grandson to help him start to learn how to read! sorry random: I love that laminator!! This would be great so that I could help my son’s teacher out, but not have to go up to the school with my 3 yr old running around! I would make a color sorting game I found on Pinterest for my son!! I’d use it to laminate a chore chart for my daughter. But, I can think of a lot of craft and organizational projects to use it for. I would make some Social Thinking Unthinkables for use in speech therapy! I would laminate copies of my high schoolers schedules. I would laminate my daughter’s art projects from last year. I want to keep them to give to her when she is older. I’d make some awards for the kids. I would laminate my son’s school projects. As homeschoolers, we have lots of maps and charts that really should be laminated. Badges. I need some stinkin’ badges! I’d create flash cards with math for my daughter. Laminate labels for school library bookshelves! Im a school librarian and the laminator lines are always so long!!!! I would laminate a chore chart and flash cards. I would like laminate my daughter’s flash cards. I would laminate chore charts. I would make up a binder of local restaurant menus. I would create flash cards to help my daughter with addition and subtraction. I would make ABC flash cards. I would laminate report cards at the end of the school year. When I was in high school, my father has $100.00 laminated for me to keep in my back pack. That way I had emergency money, but couldn’t easily spend it. I think I would repeat his idea to have some emergency money stashed about. I would laminate sight words for my son. my wife would create something for one of her dog shows. I would do division flash cards. I love your style (the chevron edges are SO cute!)! I’ve heard great things about the Fellowes Laminator! I can’t believe you guys go back in FOUR days! My daughter loved to paint. I would laminate her artwork and hang it up. I would make a family photo album of my immediate siblings, so many memories! Name tags for my preschool class! I would laminate the kids artwork !! My nine year old son writes children’s books. The first project I would do, if I were to win the laminator, would be to laminate his writings. I would laminate flash cards to help my daughter with her math. protect all the recipe cards! I would use it to laminate the recipe cards I got from my grandmother. I would protect my favorite recipes. I would use them to make communication cards. They last longer when they are laminated. I would laminate so much stuff. But I think my first project would be all their certificates from school. My hang in there posters!! The first think I would laminate would be chore charts. I would use this to laminate charts and projects in my kindergarten classroom! I would laminate all the awards my children have gotten in school to keep them for a long time. I would laminate the newspaper articles I have saved. I would laminate flash cards for both of my kids, recipes, certificates and awards…I’d love to win this! I’d laminate the flash cards we have for our son. I would make placemats for my grandson. I would laminate some of my son’s art projects and report cards. I would laminate my sons old school work. I would laminate photos, my childrens safety ID cards and make some flash cards for homeschooling first. I’d laminate some calendar pages to hang up in my classroom. I would laminate some of my son’s drawings. He is actually a very talented young pencil artist. I would laminate flashcards for my boys. I would create colorful math flash cards, individualized for my children. 🙂 Thank you. I would laminate multiplication flash cards for my daughter. The first project I would use the laminator for is some work sheets that are handled frequently. Laminating would certainly make them easier to use and longer lasting. I’d like to make math flashcards. I’d laminate some photos for they do not get destroyed. I’d laminate my flash cards for school. I would laminate artwork to use as placemats. I would use it to save my daughter’s artwork. I would use it for personal papers. alphabet practice sheets so my little one can start writing soon. Since I’m starting to homeschool my daughter this year for the first time I would laminate some of her school supplies that she’ll be using instead of making a gazillion copies. I’d use it to laminate important documents. I would use it for my autographs. 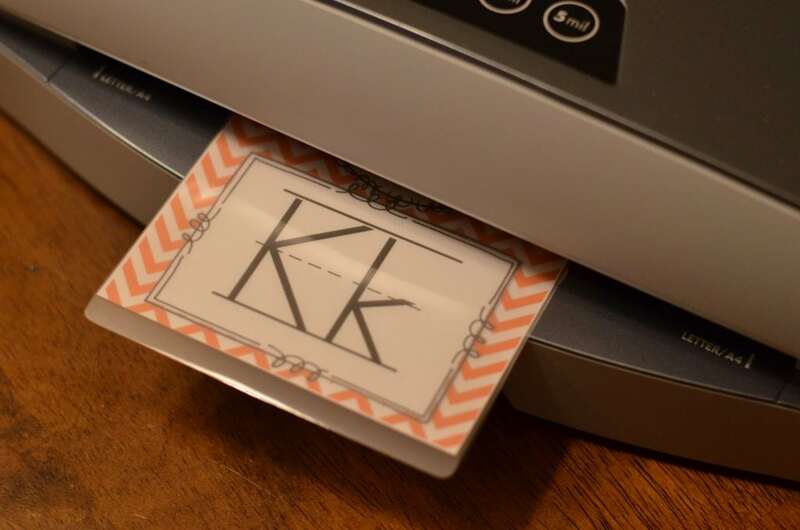 I would use it to laminate important personal papers! I would laminate some family photographs. I would make name tags for my kids!!! They are always getting bent and crinkled up!! I would do flash cards kind of like you did. I think they would help my daughter out so much and I would be able to design them myself! i would use it to make some study cards for our son! First would be laminating our hunting and fishing licenses…. The first thing I would do is laminate important documents and certificates. I would laminate pictures my kids drew for me when they were little. Speech cards for my son who uses them to communicate. I’d laminate the kids daily chore charts! I would laminate all the art work that i have decided to keep, that my son will do in school. Ah it would be nice to laminate blank maps of the US or quizzes that can be retaken! I would laminate some important papers to help them be more durable! I would make FUN personalized sketches / notecards with letters and numbers for my nieces and nephews! I would make flash cards for the kinder — math, spelling and science!